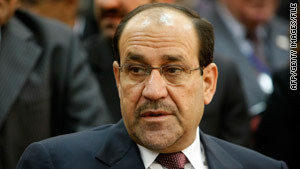 Political opponents have accused Prime Minister Nuri al-Maliki of trying to alter the results. Baghdad, Iraq (CNN) -- A manual recount got under way Monday of some ballots cast in Iraq's national elections nearly two months ago. A judicial panel ordered the recount last month of ballots cast in Baghdad province, ruling in favor of Prime Minister Nuri al-Maliki's State of Law coalition. The coalition had challenged the results in the capital province, the country's most populous. The recount of more than 2 million ballots is expected to take up to two weeks, electoral officials said Monday. U.S. and Iraqi officials said they do not expect the recount to significantly change the results of the March 7 elections, from which no decisive winner has emerged. Former Prime Minister Ayad Allawi's mainly secular coalition won 91 seats in parliamentary elections compared with 89 seats for Al-Maliki's coalition. A coalition needs more than half the seats in parliament -- 163 of 325 seats -- to form a government. Coalitions typically align with other blocs to form that majority. Both coalitions have been in talks with other large ones to try to secure the majority they would need to form a government. So far, the process has been slow. Political opponents have accused al-Maliki of trying to alter the results by overturning Allawi's two-seat lead. On Monday, less than two hours into the recount of votes in Baghdad, al-Maliki's coalition complained about the process. It said the Independent High Electoral Commission should be cross-checking ballots with registration lists -- not just recounting ballots. The coalition would not accept the results of the recount in its current form, said Hussein al-Shahristani, Iraq's oil minister and a leading member of al-Maliki's coalition. The head of the Independent High Electoral Commission, Faraj al-Haidari, said the recount procedures were based on the comission's interpretation of a court decision involving the recount. He said the commission would continue with its current recount plan unless a court ordered it to do otherwise. Last week, U.S. Ambassador to Iraq Christopher Hill voiced frustration with the delay and urged politicians to speed up the process. But the recount has not been the only stumbling block. A panel led by two Shiite politicians has disqualified 52 candidates, almost half of them from Allawi's coalition, and there are concerns that its actions could lead to a sense of disenfranchisement among Sunni Arabs -- who mostly voted for the Allawi bloc's candidates. The Accountability and Justice Commission, a panel charged with purging people with ties to Saddam Hussain's Baath party from politics, won a recent appeal to disqualify these candidates and to annul the votes they garnered in the elections. The commission currently is waiting for an appeals decision on its attempt to disqualify even more candidates, including winners. It is not clear yet what impact this will have on the seat allocation. Sunni Arabs largely boycotted the 2005 elections which led to the emergence of a Shiite led government, leaving the once ruling minority feeling alienated and driving them to a bloody insurgency and a sectarian war that gripped Iraq for years. Extremist groups, mainly al Qaeda in Iraq, are known to take advantage of political fissures and carry out more attacks to create further turmoil. The U.S. military is scheduled to drawdown troops, leaving behind a residual force of about 50,000 with a non-combat mission at the end of August. So far commanders have maintained that this delay in government formation has not derailed the pullout plan.